Australia’s John Girvan was crowned the victor of the 2014 New Zealand Deaf Poker Championship over the weekend as he will now forever be remembered as the player to win the first-ever Deaf poker tournament to be hosted by a New Zealand casino. Since 2008, Deaf Poker Australia (DPA) has been hosting ground-breaking poker events within the Deaf and Hard of Hearing community. This weekend, DPA travelled to SKYCITY Auckland Casino and held the first-ever Deaf poker tournament to be hosted in a New Zealand casino – the 2014 New Zealand Deaf Poker Championship. There were 39 total players in the tournament, which is a little down on the last year’s DPA event, but still a solid field that the organisers were happy with. Among that field there were plenty of recognisable Kiwi faces of the Deaf poker community including Tony Walton, Dylan Louie, Opeti Finaulangi, Robert Cairns, Amber Shaw, Susan Hamilton and Julie-Anne Taylor, who happened to be the last woman standing in 16th place. It wasn’t only local New Zealand players at the tables, with Aussies such as Kevin Smith, Scott Turner, Adrick Martin and John Ziogas some of the Aussies to take part in the 2014 New Zealand Deaf Poker Championship. While Deaf poker tournaments are relatively new in New Zealand, the standard of play was reportedly quite exceptional and aggressive, so aggressive in fact, that it took just five-and-a-half hours to reach the final table. Australia’s Alan Cetinic held the chip lead of the official eight-handed final table and he was joined by three other Aussies. The other four spots were filled by New Zealand poker players. Reports suggest that the rail was as big as has been seen in New Zealand poker in a long time as a three-deep crowd helped kick off the 2014 New Zealand Poker Deaf Poker Championship final table with a Mexican wave. Deaf poker icon Sokong Kim was the first player eliminated at the final table, followed by Michael Granger in seventh place. The top five players were paying and so Matthew Kennedy was eliminated in fifth place and as the bubble boy when his A-K couldn’t improve against Christian Gray’s pocket kings. One of the founding fathers of Deaf poker in New Zealand, Rhian Yates, was the first player eliminated in the money and was followed to the rail by Aussies Barry Bond (4th) and Alan Cetinic (3rd). Somewhat poetically the final two players remaining would ensure there was a Trans-Tasman heads-up battle as Australia’s John Girvan was up against New Zealand’s Christian Grey. Having dealt the fatal blow to Cetinic, Girvan began heads-up with 418,000 in chips, well ahead of Grey’s 167,000. Unfortunately the local hero Grey wasn’t able to fight back from the 3-1 chip deficit as he was eventually eliminated in 2nd place when he open-shoved and wasn’t able to hold up against Girvan who called with . The final board of the tournament read , with Girvan’s sixes enough to seal the deal. “On behalf of the entire New Zealand and Australian Deaf communities, we’d like to congratulate John on his monumental victory and to Christian for putting in a stellar performance in front of his home crowd. Our special thanks also to the Auckland Aces Deaf Poker Committee for their hard work, and of course to the crack squad of NZSL interpreters who went above and beyond their call of duty, including attending the first-ever Deaf-only Poker Tournament Director’s Workshop at ADS the night before. To all the players and supporters: thank you for your dedication and enthusiasm! No matter if you were first or last, or even if you were just there to watch, every single one of you should be proud of being part of a new chapter in New Zealand’s vibrant Deaf history. 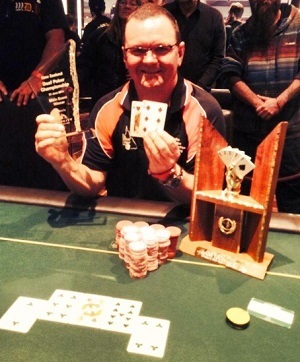 The next major Deaf poker event in Australia will be the second SA Deaf State Poker Championship on August 30, followed by “The Big Dance in October” - the 2014 DPA Championship at Crown Perth in Western Australia from October 17-19, featuring a two-day Main Event and the debut of the DPA State of Origin. Make sure to keep your browser locked to Poker Asia Pacific and like our Facebook page or follow us on Twitter to stay up to date with all the latest news and results from poker in Australia.